Teams begin work on a "Sibling Rivalry" game. After the excellent summary of Chapters 1 and 2 in our book presented by the first Jigsaw group, we quickly set about working on today's project in our assigned teams. Read a description of the game "Sibling Rivalry" (distributed in our first class meeting). Using only the core concept of "Sibling Rivalry," imagine a game that would use the elements of that competition between brother and sister as the basis for a competitive game (card game, board game, or combination of both). Come to class with at least a one page description of your idea to share with me and with your assigned group. 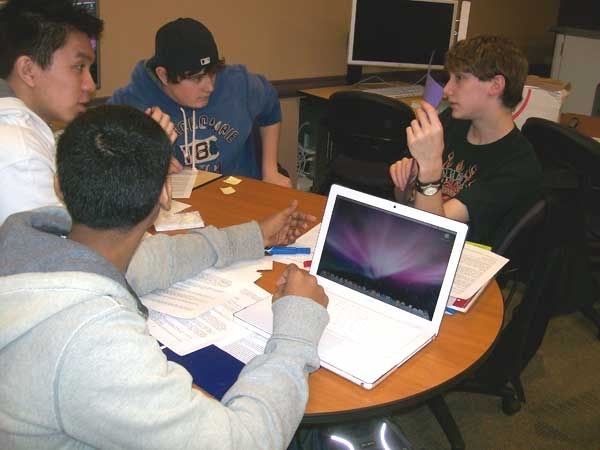 The idea was to get students to give significant thought to an idea for a game so that when they met in their groups they would be able to present their concepts and commit to a vision, perhaps incorporating ideas from other members in the development process. Team Three's prototype board takes shape. I actually feared a bit that individual students would cling to their own game concepts, even after a vote was taken, and that teams might end up in conflict between two or more warring ideas. But I was pleasantly surprised at how quickly and seemingly unanimously they came to agreement. 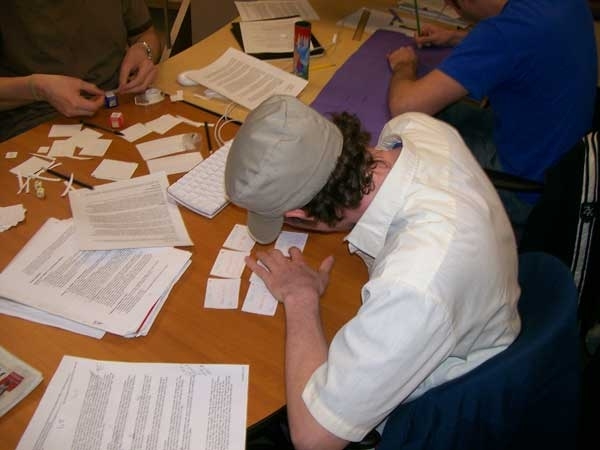 As members of Team Two told me, for example, as soon as they heard the "daemon" card game that the first presenter described, they recognized its potential and realized it was more promising than anything they had thought of themselves. In fact, they didn't even bother presenting the other ideas, but instead jumped right into the brainstorming process! 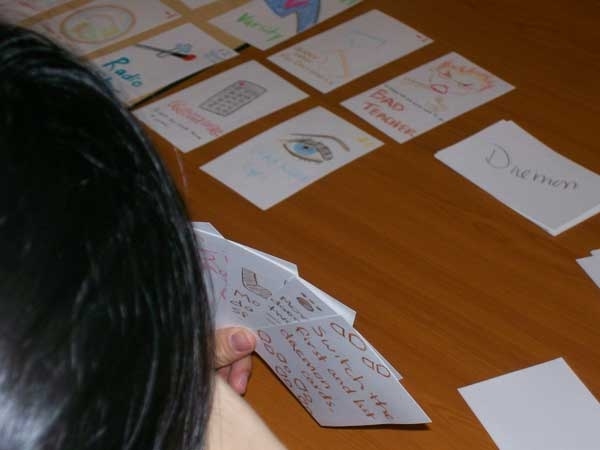 Team Two develops a "daemon" card game. I had brought various craft materials to class to help students construct their prototypes. These materials included blank index cards (for constructing game cards), manila folders (for possible board backings), colored paper, dice of various kinds (including some large plastic dice that could be modified), tape, scissors, markers, colored pencils, etc. I even had a big box of crayons. Team Five decides on a manly adventure game. Building a prototype is more akin to arts & crafts than to scientific experimentation. In fact, when I suggested to one group (who were mostly Pharmacy students) that our class environment should seem familiar to them, since they are used to doing chem labs and writing lab reports, they quickly dismissed the comparison, saying this was much more creative and "less cut-throat." In chem lab, they said, the goal is to follow the directions precisely and get exactly the result that would be expected. Creativity is not allowed. In fact, creativity is forbidden and even punished! If you make a single mistake in chem lab, your lab-mates will want to kill you and your grade will suffer. The atmosphere of chem labs is intense and stressful. Our class, by contrast, was more like pleasure and play. Creative expression was not only allowed, it was required! Team One discusses the board layout. Next time we will meet in the same groups to work on a concept for an 8x8 game as described on the syllabus (which can be 8x8 or smaller and should use checker pieces). I had distributed the sample game Ironclad, but students might also look at submissions to the 2001 8x8 Game Design Competition for ideas. I will supply Dollar Store checker sets and the same craft materials we had in class this time. 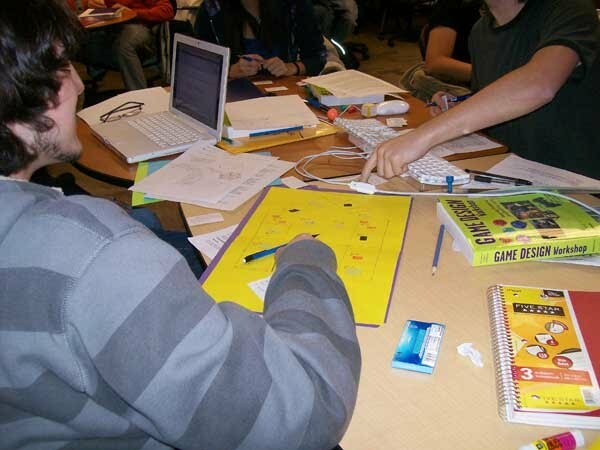 Students are required to bring any additional (or superior-quality) craft materials or play pieces that their game concepts might require. Final versions of the "Sibling Rivalry" and "8x8" projects should be done by the end of class on February 13th, with the goal of sharing and playing them on February 20th.